"Creamy, crunchy, feel good side dish. Perfect as a side dish on Thanksgiving. Goes great with chicken and pork chops. Sometimes on a rainy day I'll just eat a great big bowl of it. You can save on calories by using water instead of milk and going a bit easy on the French fried onions." Place the green beans and potatoes into a 2 quart casserole dish. Stir in the cream of celery soup and milk. Season with salt, pepper, and garlic powder, and stir in 1 tablespoon of the French fried onions. Sprinkle the remaining onions on top. Bake for 30 minutes in the preheated oven. While the casserole is baking, prepare the stuffing according to package directions. Spread over the top of the casserole. I like to mash it flat with a spatula so that it covers the entire dish. Return to the oven for about 10 minutes, or until crunchy. You can also broil for a few minutes for extra crunch. A quick, simple, sensational side dish that’s out of the ordinary. This was very good. I used hash brown potatoes instead of the sliced potatoes. I also used a half of can of cream of mushroom and a half of can of cream of celery. 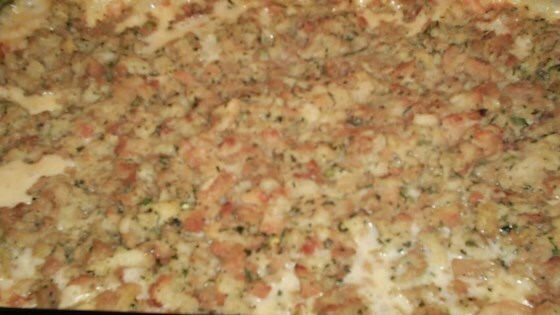 Made this added a little poultry & celery seed seasoning to stuffing mix ( to add a little more flavoring ) it was really good family Loved It ! I have a family of 5 all pick eaters. This dish made peace at the dinning table. Would not change a thing. Great can't wait to make it again. I made this for Thanksgiving. Everyone LOVED it and wanted the recipe. OMG ... Can't get enough! Very easy to make if not a little on the little flavoring side. Still pretty good though!